Students can pick up their already ordered Goody Bags on Friday April 26 at the MSC on campus. We will contact your Aggie by email 1-2 days prior to our campus delivery. If a reminder is needed, we will also contact him/her by cell phone/text while on campus. If your Aggie does not pick up their goody bag or make arrangements to have a friend pick up by 2:00 p.m. we will donate their goody bag to our Veteran Student Goody Bag program. Want to help hand out the Goody Bags? We need help in College Station from 9 am till 2 pm. Please email Barbel, our Goody Bag chair, to find out more about volunteering. must be ordered by March 29, 2019. 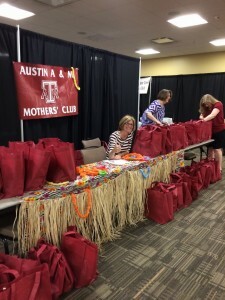 The Austin Aggie Moms offer their members the opportunity to order a morale booster before exams in the form of a bag with snacks and a restaurant gift card for their student. We call these Goody Bags and your student’s bag will contain a variety of snack items plus a gift card for a restaurant close to campus. The snack items may include but not limited to: popcorn, granola bars, peanut butter crackers, gum, breakfast bars, fruit, candy, microwave noodles, and a beverage such as an instant hot chocolate. The gift card is for Aggie Students’ favorite locations such as : Freebirds, Layne’s, Starbucks, Subway Spoons, Torchy’s and Blue Baker.